A Bermuda woman who has faced a unique battle with colon cancer has taken to sharing her story and experiences with the world at large, aiming to help those facing a similar diagnosis. Giovanna Watson was diagnosed with colon cancer in February 2014; two surgeries, eight chemo treatments, 26 radiation treatments, over 500 pills, and multiple memories later, she has launched HelloCancer.org, a website offering a wealth of information to visitors. “Instead of feeling ashamed, I decided to share my diagnosis and journey with family and friends through social media and live life the best I could in between surgeries and treatments,” Ms Watson said. The website says, “In February 2014 Giovanna Watson was the youngest person at that time to be diagnosed with colon cancer in Bermuda. “Her love was track and field in High School but since her college years, she is known by her friends, family and community for her love of Salsa and Bachata dance and music. “Her love of Salsa also influenced her and her team to create Bermuda Latin Vibes, a one stop resource for all things Latin in Bermuda and hopes that once she recovers she can energize the community once again through BLV. 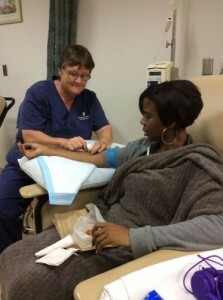 For more information about HelloCancer.org, or to contact Ms. Watson, please visit the website.. I really don’t know why people haven’t explored the alternatives to medicine…its well documented but you have to seek or search for the truths…Over 50 years of so called science and billions of dollars in charities donations and they haven’t progressed one iota towards the cure…does this not raise any eyebrows…its a well known fact that the treatment used is NOT the answer…yet people will undergo this money guzzling procedures until they succumb to the disease or The treatment. Traditional western medicine is a farce and billion dollar industry…ask any doctor how many hours of their curriculum is dedicated to nutrition…sure if I break a bone or my head is hanging by a thread then I will need their drugs or surgery. I agree nutrition is important, but can you please elaborate? What alternatives do you suggest?